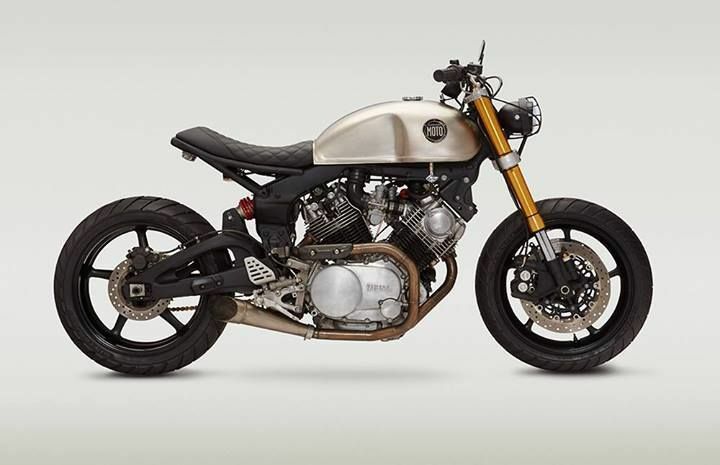 YAMAHA'S XV950 looks terrible to me. I saw this in MCN and here is their report on it, to each his own, but surely as you will see at the bottom of my Blog, there are far better ways to change the stock XV into something cool? the paint Scheme looks something out of a Home depot catalog, the Body work is too Boxy and it looks more like a Customized Speedway bike, what do you think??? 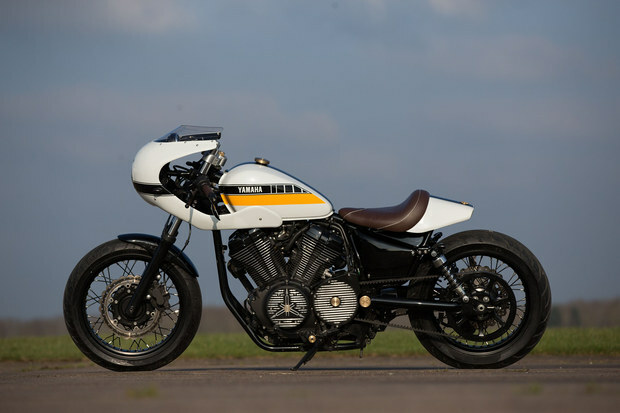 Yamaha’s ever-growing Yard Built series has gained another son in the shape of this Yamaha XV950 by Swiss builder GS Mashin. The result, the Yard Built XV950 ‘ULTRA’ is a total transformation, bringing a whole new vision and style to the Yard Built line up. Founded three years ago by ‘Niners’ crew member Tom Mosimann, GS Mashin blends solid, hand craftsmanship with eye catching new design ideas. 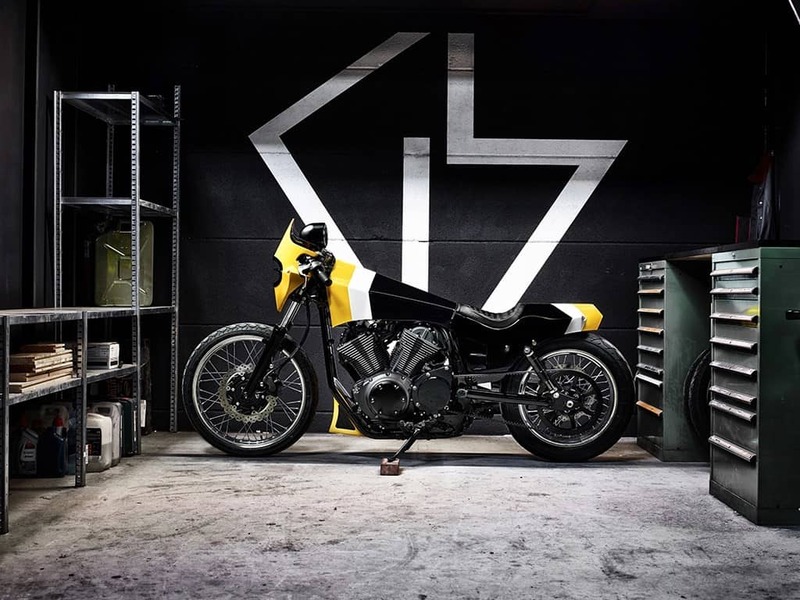 Working from a small garage in Bern, Tom works to deliver truly different bikes within functional and technical requirements, meaning everything he builds is fully roadworthy and not just eye candy. The Yard Built XV950 ‘ULTRA’ is no exception, looking radically different from the standard XV950 it’s a truly custom machine that follows the Yard Built principles requiring no cutting or welding to the frame to realise the concept. “I love what Tom has created with the XV as his base,” saysYamaha Motor Europe Product Manager, Shun Miyazawa. “I’m really happy that despite going for a really radical look, he shares our principles that a custom machine needs to retain the most important function; rideability. The Yard Built XV950 ‘ULTRA’ fairing is handmade from 1.5mm steel sheet with the mounts cut from a stainless steel pipe. A small Bates floodlight sits inside the fairing with the two Highsider turn signals. The custom fuel tank is also hand crafted from 1.5mm steel with the upper edge made with a trimming press. The lower section is cut from the original XV950 fuel tank. One of the standout elements of the build has to be the super clean prototype rear suspension units built by K-Tech, based on their signature style Bullit units. The hand crafted steel tail unit wraps around a Shin Yo rear light unit and the seat is again a hand made affair with leatherwork by Jose Rey Saddlery. The beautiful aluminium upper fork crown is machined by Asic Robotics and is super clean without the holes for the risers. The wheels are a work of art, the original hubs were used then 18inch back and 21inch front rims were added with new spokes, with ABS! 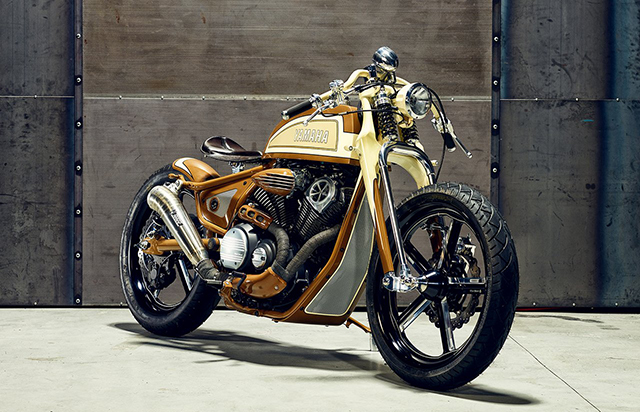 I am always a fan of many bikes but- this one I think misses the mark, but that’s my 2 pennies worth and you may like it and thats fine, but i would of gone a different route like these. Really cool and so much work but I dig this version. Bang- What a tough machine and I would love to own this myself. What another winner we have here, tough, big, brute- and sure would be fun to ride and has that Nostalgic paint scheme too. These is a great machine as well, so how did they go so wrong with the main feature I have here? Well I leave it up to you, but I know the route I would of taken. This entry was posted in Blog and tagged brat, cafe racer, chopper, custom, racer, Street, ton up, tracker, V twin, XV, yamaha.